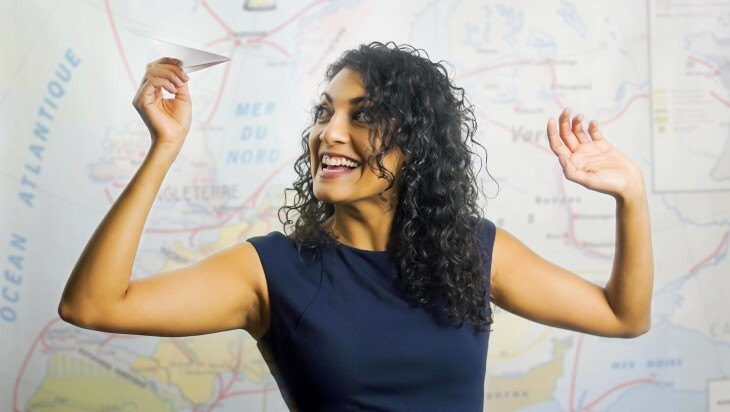 Canadian comedian, Aliya Kanani, has come to Melbourne for her first solo comedy show, Where You From, From? As a person of colour, it's a question she has been asked many times but it's also a question that people are often not satisfied with the response until they get one that confirms the "otherness" of the person. In her show, Kanani explores how these moments have played out in her life, but it's also about how she sees it play out in others' that results in this show being more positive and empowering than you would initially expect. There is so much energy to Kanani and she is genuinely thrilled to be performing in Melbourne. However, she never lets this excitement envelop her and remains focused on giving the audience a good time. She's extremely comfortable with the material - after all, she has lived it - but she tells it in a way that's like the first time a friend is telling you a story about something that happened to them. There's great interaction with the audience and Kanani is constantly checking in with us to make sure we are still on board. There are undoubtedly numerous stories that Kanani has to share regarding identity, race and belonging. She has travelled to thirty countries, attended ten schools and speaks six languages so the question of "where you from?" comes with a lot of history. It is a little disappointing then that Kanani's show only has a running time of 50 minutes - which also includes a five minute support act - as it feels like there is so much more Kanani could unpack with a further 15 minutes. The anecdotes we do hear are very entertaining and the flow from one to the other is smoothly delivered. Kanani tells us of the dangers of yelling out your partner's name in an airport (particularly problemtic when that name happens to rhyme with "Allah") and reveals a surprising link between people of colour and cancer. While her "otherness" is the central theme of the conversation in Where You From, From?, the heart of Kanani's show is in forming a "togetherness" with the room and her audience. It's a fun show in which Kanani highlights issues on racism, sexism and identity while ensuring the audience always has plenty to laugh at and plenty to bond over. Venue: Coopers Inn, 282 Exhibiton St., Melbourne.